We previously reported the usefulness of the αGal epitope as a target molecule for gene therapy against cancer. To induce cancer cell specific transcription of the αGal epitope, an expression vector which synthesizes the αGal epitope under the control of a promoter region of the human telomerase reverse transcriptase (hTERT), NK7, was constructed. NK7 was transfected into a human pancreatic carcinoma cell line, MIA cells, and telomerase-negative SUSM-1 cells served controls. Expression of the αGal epitope was confirmed by flow cytometry using IB4 lectin. The susceptibility of transfected MIA cells to human natural antibodies, was examined using a complement-dependent cytotoxic cross-match test (CDC) and a flow cytometry using annexin V.
The αGal epitope expression was detected only on the cell surfaces of NK7-transfected MIA cells, i.e., not on naive MIA cells or telomerase negative SUSM-1 cells. The CDC results indicated that MIA cells transfected with NK7 are susceptible to human natural antibody-mediated cell killing, and the differences, as compared to NK-7 transfected telomerase negative SUSM-1 cells or telomerase positive naïve MIA cells, were statistically significant. The flow cytometry using annexin V showed a higher number of the apoptotic cells in NK-7 transfected MIA cells than in naïve MIA cells. The results suggest that αGal epitope-expression, under the control of the hTERT-promoter, may be useful in cancer specific gene therapy. One of the common difficulties commonly encountered in cancer gene therapy is manipulation of a gene which acts exclusively in cancer cells, without affecting normal cells. For instance, transfecting suicide-gene, such as members of the caspase family, in order to induce apoptosis should affect only cancer cells, not normal cells. For this reason, cancer specific transcription of a transfected gene driven by a promoter region of human telomerase reverse transcriptase (hTERT) has recently been reported [1, 2]. Telomerase is a ribonuclear protein complex that has hTERT as a catalytic domain. The recent cloning of both hTERT and the RNA component (hTERC) of human telomerase [3, 4] has provided an opportunity to directly investigate the role of telomerase and telomere maintenance in the replicative life span of a cell. While hTERC is abundantly expressed in both normal and tumor cells, hTERT expression was shown to correlate with telomerase activity, suggesting that hTERT is the limiting component of the enzyme. In normal human tissues, telomerase is detected only in germ cells, lymphocytes, endometrial cells, keratinocytes and intestinal cryptic cells, most human somatic cells do not express the activity of this enzyme . On the other hand, telomerase activity is detected in approximately 90% of human cancer cells of various origins [6–8]. The promoter region of hTERT has been cloned [9–11]. The ubiquitous transcription of telomerase in cancer cells may be partially controlled by the function of the hTERT promoter. As mentioned above, the hTERT promoter region has been used as tumor specific promoter in several studies [1, 2]. The αGal epitope is known to be a major xeno-antigen . Humans and Old World Monkeys do not have the αGal epitope, having instead, anti-αGal antibodies, i.e., natural antibodies. The αGal epitope, when expressed on the cell surface, binds to natural antibodies in human serum. This binding activates the complement cascade, leading to complement dependent cell lysis . The αGal epitope is synthesized by the enzyme α1–3 galactosyltransferase (α1–3 GT) . We previously demonstrated transfection of the bovine α1–3 GT gene and expression of the αGal epitope to transform human pancreatic and hepatocellular cancer cell lines, making them be susceptible to natural antibody-mediated cell lysis . In that study, bovine α1–3 GT was transcribed under the control of the cytomegalovirus immediate-early promoter (CMVIE), which exerts effects not only on cancer cells but also a variety of normal cells. In the present study, we constructed the vector, NK7 (Fig. 1), in which transcription of the bovine α1–3 GT gene was driven by the hTERT promoter. The transfection of NK7 into human cancer cell line brought about expression of the αGal epitope only in telomerase-positive cancer cells. Transcriptional activity of the hTERT gene promoter, which we cloned, was tested in luciferase assays (Fig. 2). The hTERT gene promoter showed approximately twofold higher than that of the pGL3-Basic Vector (Promega). These results indicated that the cloned hTERT gene promoter was fully functional. HTERT promoter activity in MIA cells. Control: pGL3-Control Vector (Promega). Basic: pGL3-Basic Vector (Promega). PhTERT: hTERT gene promoter subcloned to pGL3-Basic Vector. Relative activities are expressed as means ± SD. As described in Methods, SUSM-1 cells were shown to be negative for the telomerase-activity. The αGal epitope was not detected on the cell surfaces of either naïve or NK7-transfected SUSM-1 cells (Fig. 3A,3B). Naïve MIA cells did not show a positive log shift for the αGal epitope (Fig. 3C). On the other hand, NK7-transfected MIA cells showed a high positive log shift for the αGal epitope (Fig. 3D). These results indicate that the hTERT promoter acts only on MIA cells, which are telomerase-positive, i.e., not on SUSM-1 cells which are telomerase-negative. Detection of αGal epitope by flow cytometry. 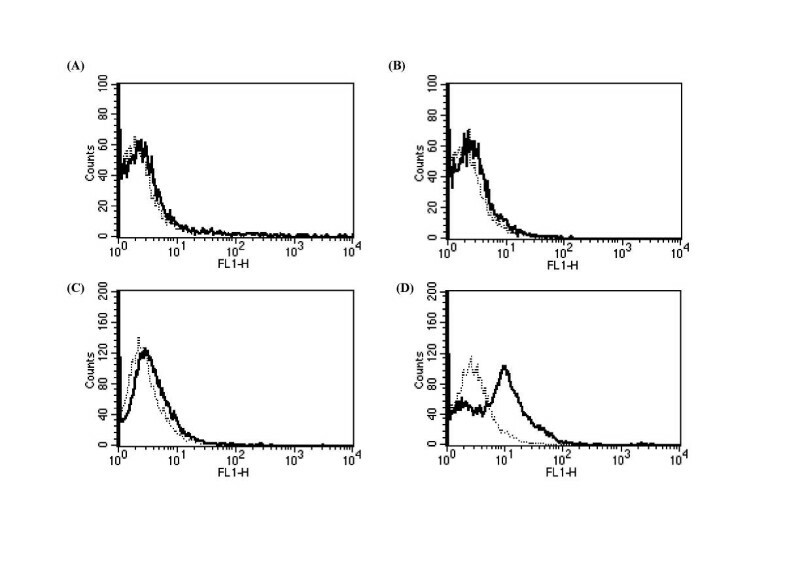 Using FITC-conjugated IB4 lectin, the αGal epitope was detected on NK7-transfected MIA cells (D), but not on naïve SUSM-1 cells (A), NK7-transfected SUSM-1 cells (B), or naïve MIA cells (C). (Dotted line; unstained. Solid line; stained). Next, the susceptibility of NK7-transfected MIA cells to human natural antibody-mediated cell lysis was examined by CDC. Naïve SUSM-1, naïve MIA cells and NK7-transfected SUSM-1 cells were resistant to natural antibody-mediated cell lysis (Fig. 4A). In contrast, NK7-transfected MIA cells were effectively lysed by human natural antibodies (Fig. 4B). A comparison of the percentages of dead cells among CDC assays is shown in Table 1. The number of dead cells was significantly higher in NK7-transfected MIA cells than in naive MIA cells, NK7-transfected SUSM-1. Complement dependent cytotoxic cross-match test NK7-transfected SUSM-1 cells (A) were resistant, while NK7-transfected MIA cells (D) were susceptible, to complement-mediated cell lysis. Dead cells appeared darker than living cells. Naïve SUSM-1 and naïve MIA cells showed similar results as that of NK7-transfected SUSM-1 cells. Percentages shown are of dead cells analyzed by the complement-dependent cytotoxic cross-match test. The results are presented as means ± SD from three independent experiments. (α) indicates a statistically significant difference between NK7-transfected MIA cells and other cells (ANOVA: p < 0.05). Next, the involvement of the apoptosis in the mechanism of our model was examined by flow cytometry, because in rat model, it is known that activation of complements itself can induce apoptosis in target cells. Naïve MIA cells did not show a positive log shift for the αGal epitope, whereas NK-7 transfected MIA cells showed a positive log shift for annexin V (Fig. 5B). 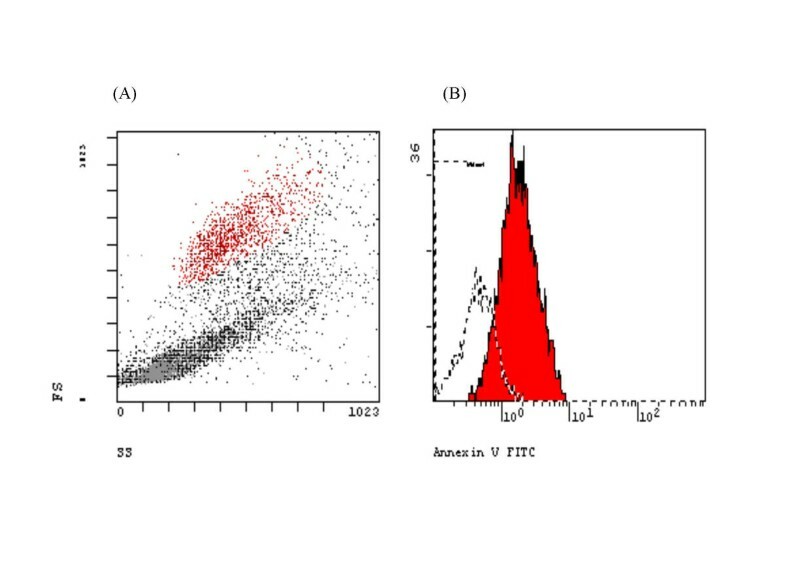 Flow cytometry using annexin V (A) Red colored cells were analyzed by histogram. X-axis: Forward scatter. Y-axis: Side sactter. (B) Apoptosis was induced in NK-7 transfected MIA (solid line) by human natural antibodies and complements. Naïve MIA cells (dotted line). In a previous study, we found that human cancer cell lines, which had been transfected with the bovine α1–3 GT gene, were effectively killed by circulating human natural antibodies . In that study, transcription of the bovine α1–3 GT gene was driven by CMVIE. This promoter is expected to work in all cell types. Clearly, a vector which exerts its effects exclusively in cancer cells was essential. The present study demonstrated the hTERT gene-promoter to be capable of driving the transcription of the transfected α1–3 GT gene in telomerase-positive MIA cells, but not in telomerase-negative SUSM-1 cells. The mechanism of by which the αGal epitope and human natural antibodies produce cell lysis is mainly complement-mediated . Human cells have complement regulatory molecules on their cell surfaces which inhibit uncontrolled activation of the complement cascade. These molecules are known to play important roles in human disease . There are diseases in which activated complement components overcome the inhibitory effects of complement regulatory molecules . For instance, red blood cells are lysed when blood from a donor with a different blood type is transfused, even though red blood cells have complement regulatory factors including CD55 and CD59 on their cell surfaces. Complement components and complement regulatory molecules are balanced in the healthy state. In the present study, we used NK7-transfected MIA cells which showed relatively high expression of the αGal epitope by flow cytometry. The previous study suggests that complement-activation induce apoptosis in cells . Although annexin V staining does not distinguish strictly apoptosis from necrosis (Fig. 5), apoptosis may play a role in complements-dependent cell deaths. As shown in Figure 3, NK7-transfected MIA contained αGal-negative cells. It is known that the activity of telomerase depend on the cell-cycle . The stage of the cell cycle of NK7-transfected MIA cells so varied and that may have had the influence on the strength of the activity of the expression of the αGal-epitope. The α1–3 GT gene was inactivated by a point mutation and became a pseudogene in humans and old world monkeys . Instead, humans have abundant anti-αGal antibodies, i.e. natural antibodies. Our strategy for anti-cancer gene therapy is to induce abundant expression of the αGal epitope only on the cell surfaces of cancer cells. Once this is achieved, it is anticipated that the cancer cell will be lysed by natural antibodies which already exist in the human body. As long as expression of the αGal epitope remains cancer cell specific, using the hTERT gene promoter region as a gene-promoter of the α1–3 GT gene is a promising treatment strategy. To apply our construct to clinical gene therapy, expression of the αGal epitope must be adequate to overcome the actions of complement regulatory molecules. Strategies to enhance this expression or somehow modify complement biology, to increase the sensitivity of complement-mediated cell lysis, are thus needed. The full length bovine α1–3 GT cDNA was cut at Apa- and BamH-sites of N3GA  and ligated to an pEGFP-1 vector (CLONTECH, Palo Alto, CA) to form an E1GA vector. The hTERT promoter region was amplified by PCR and subcloned, as previously described . Briefly, genomic DNA was extracted from human pancreatic carcinoma cell line, MIA PaCa-2 . Then, 100 ng of genomic DNA were amplified by PCR using Gene Taq (Nippon gene, Tokyo, Japan). The following primer sequences were used for PCR: 5-TCTGGATTCCTGGGAAGTCCTCA-3, 5-ACGCAGCGCTGCCTGAAACTCG-3. A 1082-bp PCR product was subcloned into the pGEM-T vector (Promega, Madison, WI). The fragment was cut at Sal- and Sph-sites and ligated to a pSP72 vector (Promega), then cut at Xho- and Kpn-sites and finally ligated to the E1GA vector (NK7, Figure 1). The luciferase reporter plasmid was constructed by subcloning of the hTERT promoter region to Kpn I and Bgl II sites in the pGL3-Basic vector (Promega). MIA cells were seeded at 3 × 104 per 16-mm well and transfected 24 h later with complexes containing 1.2–1.9 μl of LipofectAMINE, 4 μl Plus reagent (GIBCO, Rockville, MD) which contained the Renilla luciferase gene as a transfection efficiency control, and 420 ng of firefly luciferase reporter plasmid per well. Lysates were prepared 24–48 h after transfection by adding 100 μl of reporter lysis buffer (dual luciferase reporter system, Promega), and their luciferase activities were measured with an analytical luminometer (model TD-20/20, Turner Designs, Sunnyvale, CA) and expressed as relative luciferase units (RLU), calculated by determining the ratio of the intensity of the light produced by the Renilla luciferase pRL-TK plasmid. All luciferase assays were performed in triplicate. MIA cells and SUSM-1 cells  were used. SUSM-1 cells were negative for telomerase-activity, such that the hTERT gene-promoter was expected to not be active in SUSM-1 cells. Cells were cultured in Dulbecco's modified eagle medium (GIBCO), containing 10 % fetal calf serum in a 5% CO2 incubator. Twenty micrograms of NK7 were electroporetically transfected into 2 × 106 cells with a GENE PULSER (BIO RAD, Hercules, CA). Approximately 1 × 103 cells per well were cultured in a medium containing neomycin (Geneticin, GIBCO), in a 96-well plate, for 10–14 days. The neomycin concentrations for the selection of MIA cells and SUSM-1 cells were 1 mg/ ml and 0.4 mg/ ml, respectively. Individual neomycin resistant clones were picked up and transferred to a 24 well tissue culture plate, and DNA extracted from these cells was subjected to PCR to confirm integration of the α1–3 GT cDNA. PCR was performed using the following primers. Sense strand primer: 5'-AGCTCAGTAGAACTTGGTACTTTT-3', and anti-sense strand primer: 5'-CATCTGATTACCACAGGTTCATT-3'. After an initial denaturation for 3 minutes at 94°C, amplification was performed for 25 cycles in a final volume of 50 μl using 2.5 u of Taq DNA polymerase. Each cycle consisted of 30 seconds at 94°C, 30 seconds at 60°C and 60 seconds at 72°C. The PCR products were separated by 2% agarose gel electrophoresis and the products were visualized by ethidium bromide. Ten neomycin-resistant clones from MIA cells or SUSM-1 cells, which were positive for the 1355 bp-PCR product, were transferred to 10-cm tissue culture plates to obtain a sufficient number of cells for flow cytometry and complement dependent cross-match test (CDC). The promoter activity of the hTERT gene was expected to operate in the endogenously telomerase-positive MIA cells, but not in the telomerase-negative SUSM-1 cells. Promoter activity was reflected by detection of the αGal epitope on the MIA cell surface, in cells which had been efficiently transfected with NK7. The αGal epitope was detectable by flow cytometry using FITC-conjugated BS-I ISOLECTIN B4 (IB4 lectin, Sigma, St. Louis, MO). IB4 lectin recognizes the terminal galactosyl epitope in the α linkage . Flow cytometry was performed as follows. 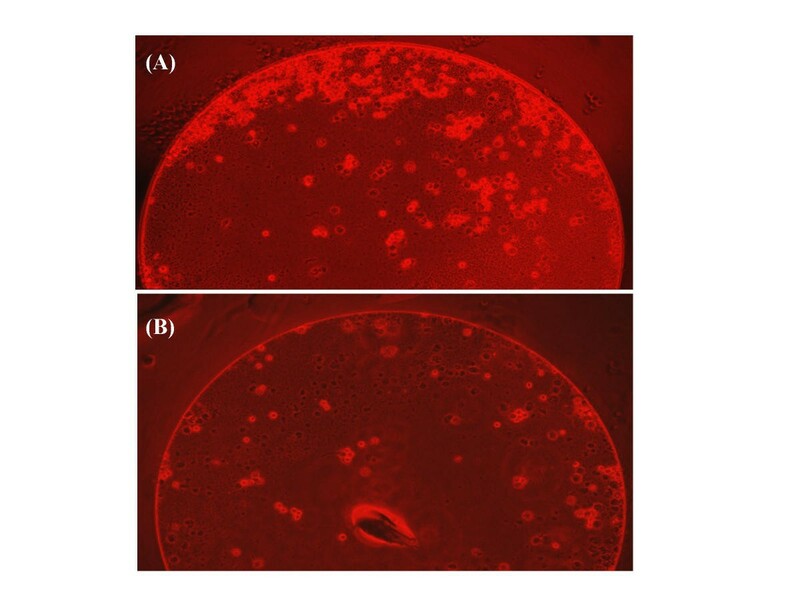 Approximately, 1 × 106 cells were incubated in 10 μg of IB4 lectin. After a 60-min incubation, the cells were washed twice with PBS, and analyzed on a FACscan (Becton-Dickinson, Mountain View, CA). As previously reported, we used a CDC assay to examine the susceptibility of transfected cells to antibody-mediated cell lysis . Approximately 2 × 106 cells were cultured with 50 μl of human serum at 37°C. To exclude the possible involvement of anti-blood type antibodies, pooled human sera from blood types A, B, O and AB donors were used as the source of natural antibodies, at each experiment. After a 50-min incubation, 5 μl of rabbit complement were added to the plates and a further 70-min incubation was carried out. Then, a 5 % eosin solution was added to the plates, and dead cells which appeared darker than the living cells were counted under a microscope. In each experiment, the three wells containing the highest number of dead cells were selected, and the percentage of dead cells was calculated. The ANOVA was used for the statistical analysis. CDC assays were performed on the same day of the flowcytometry. The annexin V binding assay was performed using the Annexin V-FITC Apoptosis Detection kit (PharMingen) according to the supplier's instruction. At least 1 × 106 cells prepared by human serum and rabbit complement described in CDC were incubated with FITC-conjugated annexin V at room temperature for 15 min. The cells were then analyzed by flow cytometry.